I have been recently informed of a stunning revelation, that the person we believe to be the game administrator is not who we think he is. It all started with an extremely brave confession from hammer1. He was a good, wholesome family man who loved to laugh and make others laugh as well. But that all changed a few weeks ago. He stopped his trademark brand of humor. Stopped smiling in fact. He barely touched his food, and didn't even bother to kneel down to get his snacks from the vending machine. When I first took this job, I knew that I would have a chance to do something great. I could change the community for the better, do the things that normal players couldn't. So I decided to start with the hammer1 mystery. What happened? It took quite some time. He was reluctant to talk, and maintained that nothing was wrong for days. Then finally one day, he broke down and confessed to me in chat. 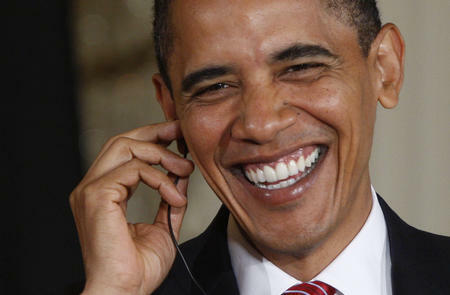 [10:52:31 PM] <Obama> Message me the details ASAP! But he didn't elaborate. I asked why. It may sound hard to believe, but other players have reported Mike sending extremely disgusting messages to them as well. A web of lies constructed, and player after player is getting caught. But here is where is gets insane. Mike was online during this whole ordeal. And he only had one thing to say. Who is "he"? Who exactly is on the Mike account? Was Mike lying when he told me that line? Are there multiple people using the account? Or was somebody holding the real owner of the account hostage? He didn't respond to any of my requests after that confession, but I did not relent. I maintained a 24/7 watch on him, and I witnessed some very interesting conversations. [07:38:11 PM] <Aka5ha> Excuse me everyone, I am a new player and in need of assistance. Can somebody direct me to a place where I can obtain this helpful information? [07:38:50 PM] <Mike> You are a worthless piece of trash if you don't know honestly. It's clearly labeled game guide you moron. [07:40:01 PM] <Mike> Just get off my game please. [03:11:26 PM] <Santhush> I need help with leveling up, can somebody help? [03:11:57 PM] <Mike> Sure thing my good friend, I will be able to assist you. Just give me a minute, I am almost done with my daily volunteer efforts for the needy and disabled, and I just need to stop by the bank to withdraw the money that I will be donating to charity of HIV research. Same account, but two shockingly different personalities. Who is Mike really? If I had to guess, I would say he's one person, but with a multiple personality disorder. But I have no proof for that statement. Maybe I'll find proof by the next issue. Maybe I won't. [03:28:15 AM] <Jonathan> KEEP ROLLING ROLLING! [03:28:09 AM] <Jonathan> LIMP BIZKIT! In the last issue, we asked a question and invited people to answer it. 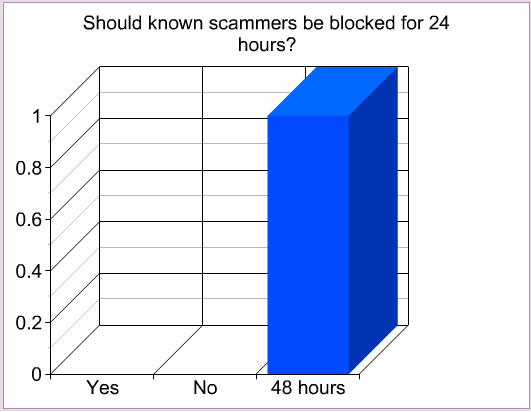 The question was: Should known scammers be blocked for 24 hours? -A controversial answer. Also, it was the only controversial answer. In fact, it was the ONLY answer. Now we understand that it may be hard to process all this info at once, I mean if only it was organized into simple visual graphs. 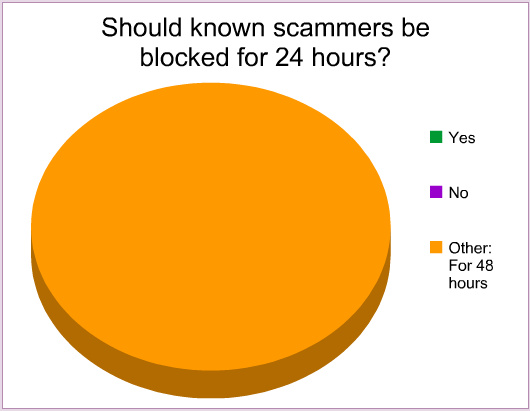 Luckily for you guys, we have the tools to do so! Hopefully that clears things up if you were confused. The Unsustainable family shot at Fish. The Unsustainable family no longer exists. It would be cool if you guys could message me ANY sort of news that occurred. Makes writing much easier ?